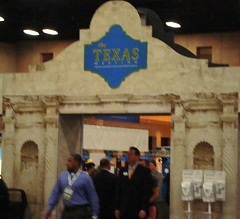 Annually during the first weekend of May, the Texas Dental Association holds its statewide conference in San Antonio. With Cinco de Mayo festivities in the air, many dental offices make the journey for continuing education as well as taking in the Riverwalk and other local attractions. It is always a fun three days and this year did not disappoint. The weather was beautiful and the convention center was alive with activity. 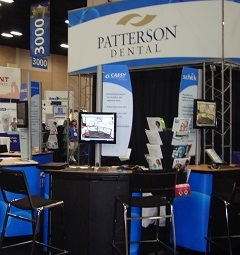 Patterson Dental was situated on the center aisle, first booth, allowing many to stop as they prepared to make their way through a total of seven aisles of vendors covering every aspect of dentistry and then some. It was great fun to visit with existing customers, potential new customers and a host of others. Everyone had great questions and the six technology advisors kept busy making sure no one left without getting valuable information they could take back to their offices. 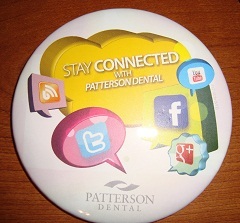 New this year were the buttons and flyers highlighting our social channels. It was surprising to those who stopped by to learn that Patterson has a presence on so many sites that are hot connectivity links. With a focus on the blog that contains a wealth of information, www.offthecusp.com, offices were excited to know how to access these channels. The fun continued helping them connect via Facebook and Google+, utilizing these links in addition to YouTube and Twitter for their own websites. Another plus for our customers! Patterson is staying in step with technology, keeping people connected in the ways we are socially communicating. 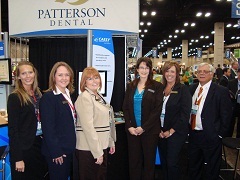 It speaks to the commitment Patterson provides in relationships and exemplifies our support of offices as we partner with them to grow their practices.